The author, speaker and educator discusses his memoir, which is one of the five books for Canada Reads 2019. It's been more than 70 years since the end of the Second World War, but Max Eisen remembers those days like they were yesterday. Eisen is a Hungarian Jew who, along with his family, was deported to German-occupied Poland in the spring of 1944. They were violently removed from their home and loaded onto cattle cars bound for the concentration camps of Auschwitz-Birkenau. Max would emerge as his family's sole survivor. 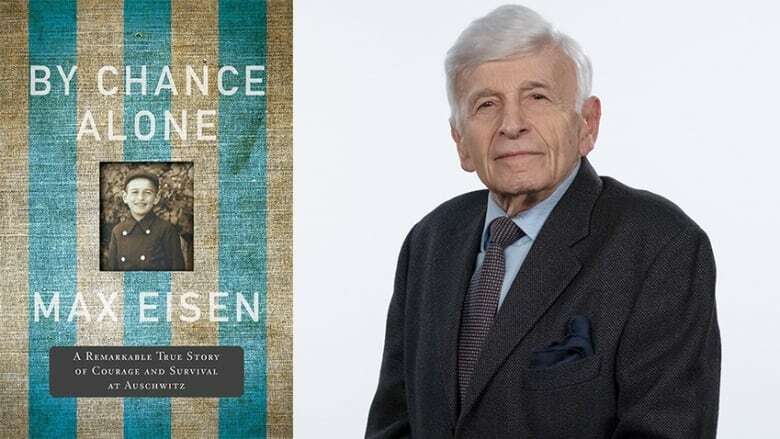 His memoir, By Chance Alone, recounts his childhood, the time he spent in the Auschwitz concentration camp and his eventual rescue. The book was a finalist for the 2017 RBC Taylor Prize. Now it's a contender for Canada Reads 2019, where it will be defended by Ziya Tong. The Canada Reads debates take place March 25-28, 2019. They will air on CBC Radio One at 11 a.m. (1 p.m. AT/1:30 p.m. NT), on CBC at 4 p.m. (4:30 NT), live streamed online at CBC Books at 11 a.m. ET and will be available on the free CBC Gem streaming service. Eisen spoke to Shelagh Rogers on The Next Chapter about By Chance Alone. "When I was nine, I always liked to see the military marching with the horses and equipment. I remember as kids we used to march behind them. It was exciting. But I didn't know at the time that Czechoslovakia had just declared martial law because they believed Hungary was going to invade. "I could hear ranting and raving coming thought the radio. I understood some German and I could hear Hitler say he intends to eradicate the Jews from the face of Europe. I knew that something was happening but I didn't know what. Then the year later in 1939, Hungarian troops came marching in. And then we knew that things were really bad." "At Auschwitz, my paternal family were murdered. My maternal family were killed in a death camp in 1942. We were still in Hungary and received a telegram that they was taken away. It was like a death warrant. They disappeared. Six million Jews disappeared. "My father, uncle and I were taken to a concentration camp in Auschwitz. There, a selection process happened and I went through it. My father and uncle didn't. And next morning I had to line up for the daily head count drill where I was counted among 30,000 people. If somebody had died overnight and rolled under a bunk, they had to find the body and bring him down. Because nothing moved until the count was right. "After that, I had to go to my job where I was marched out several kilometres or so. I came back at night and my father and uncle were still not in their barracks. I went to the quarantine and called their names. Finally we made contact and, through the fence, my father gave me a blessing. He told me that if I managed to survive it must tell the world what happened." "I didn't want to write a book at first. As a public speaker talking about the Holocaust, I can speak about what I want to touch on — and also I don't want to talk about. I don't want to let my emotions get the better of me because I want people to learn. I don't want to make people cry but I can still see tears in the audience. But many of the students asked me to write everything down on paper. And I keep hearing the voice of my father to tell the world about what happened. I realize that when I'm gone, at least there will be this book."